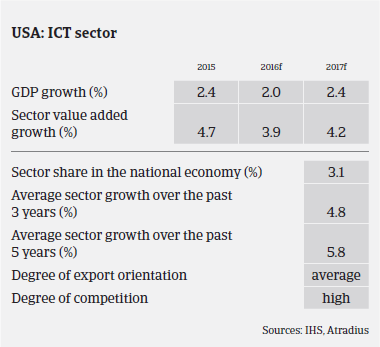 The US ICT market is expected to benefit further from stable economic growth and robust private consumption, which is helped by wage growth, employment gains and decreased energy prices. According to the Consumer Technology Association (CTA), the US consumer technology industry´s retail revenues will increase to USD 287 billion in 2016. Innovations such as wearables (e.g. health and fitness devices along with smart watches), 3D printing, virtual reality and drones areexpected to be the main drivers of growth and to show double-digit growth rates. Smartphones remain the secondary revenue driver in the segment, but revenue growth has slowed as product categories have matured. According to CTA, smartphone revenues are expected to reach USD 183 billion in 2016, up 4% year-on-year. That said, sales of tablets are expected to decrease 12% this year, to USD 18 billion. With new vehicle sales expected to grow in 2016, manufacturers of automotive electronics and audio systems are likely to benefit from higher utilisation of 4G technologies. It is expected that by 2020, 75% of all cars will be connected to the Internet. As in 2015, the outlook for the telecom and semiconductor segments remains positive. Investments in infrastructure remain strong within the telecom sector as wireless providers look to expand network capabilities and improve service offerings. Given the role of semiconductors within mobile devices and consumer electronics, this is likely to remain an important economic driver for the foreseeable future. Despite the mainly robust growth rates in many ICT segments, high competition is still leading to low pricing strategies and margin compression for distributors and retailers alike. Margins of manufacturers are impacted by the already high market penetration of mature product categories and the subsequent need for innovation. Many ICT businesses continue to rely heavily on bank facilities and external financing, resulting in leveraged balance sheets. It is expected that the payment trend for 2016 will be on par with that of 2015 with little change in the overall payment behaviour. 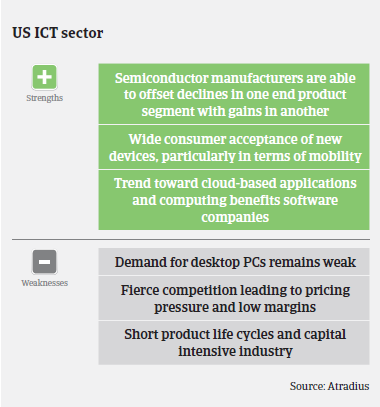 ICT insolvencies are expected to remain stable or even to increase slightly by up to 2% in 2016 (in line with the overall US business trend), given high competition, many start-ups and short product cycles. 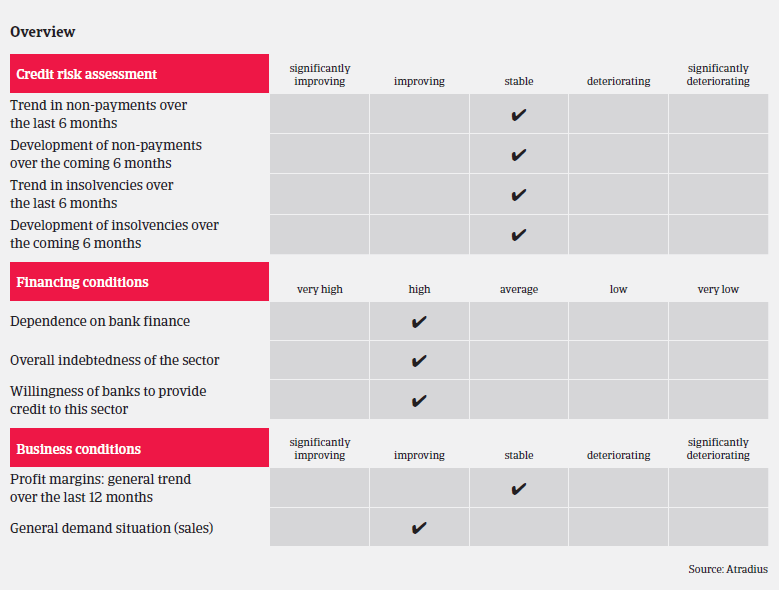 As in 2015, our underlying underwriting strategy remains cautiously open with a focus on favourable subsectors such as smartphones, tablets and health technology products along with other emerging technologies, while steering clear of unfavourable or declining subsectors like PCs. Given the economic downturn in Brazil and currency volatility in Latin America, some exporters have been impacted by cash flow issues in this region, and are therefore more closely reviewed. Product life cycles still remain short and therefore a company’s long-term sustainability is driven by innovation and its ability to develop new products and bring them quickly to the market. Therefore, when analysing buyers, the level of transparency in their products and their life cycles – including any insight into buyback arrangements for old or obsolete products – is key. With short life cycles and technology quickly becoming obsolete, it is important for us to know which end markets and subsectors are being served.